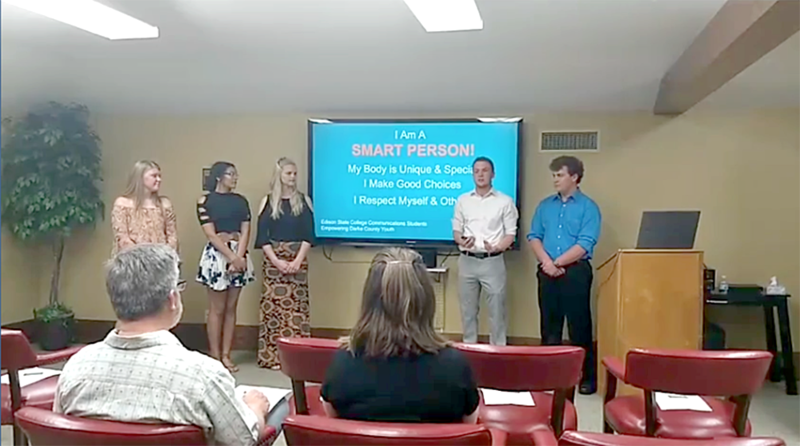 The Edison State Darke County Fundamentals of Communications students made a drug abuse presentation at the Greenville Public Library. The students were (L to R) Kathryn Combs, Morgan Sparks, Autaum Moore, Josh Schrock and Jackson Plush. Edison State Community College Darke County communications students accumulated over 2,000 hours of community service during their fall and spring 2017-18 semesters. They made nine anti-bullying presentations, seven drug abuse presentations, and helped provide over 3,000 contact hours to Greenville students in Empowering Darke County Youth’s After School Tutoring Program. Robinson added he had 110 students in the fall and spring semesters… 95 of them participated in one or both community service options. The tutoring program has brought back former students since its inception in 2016. They simply want to help. One Edison State student, Jim Kildow, has accumulated over 400 hours working with the Empowering programs.